Long, lazy days on sunny Gili Air have left me toying with an idea of doing something new regarding my pirate project. Namely, I’ve been thinking of turning it into a book of sorts! Now, I’m not talking about an epic novel or anything like that, but simply collecting the fiction and fact around Port George into one something like a compendium, providing fellow gamers – whether RPG or minis – with a ready-made fictional early 18th century town somewhere in the Caribbean. NPCs, plot hooks, historical facts and so on. Nothing system specifix, just things that spark the imagination and maybe provide inspiration and ideas for gaming and painting. 20-30 pages maybe. This would of course give me a great opportunity to commission art from friends (I definitely want a map and some character illustrations), write some scraps of fiction and do some more pirate research. What I want most of all, though, is to create something, to make those minis, buildings and these blog posts into something more than just their sum. Who knows, maybe someone else might find it interesting or inspiring as well! So, dear readers, what do you think? Cool idea or silly waste of time and effort? Something you might consider getting once finished, as a pdf maybe? What would you like to see in something like this? Any other comments or ideas? 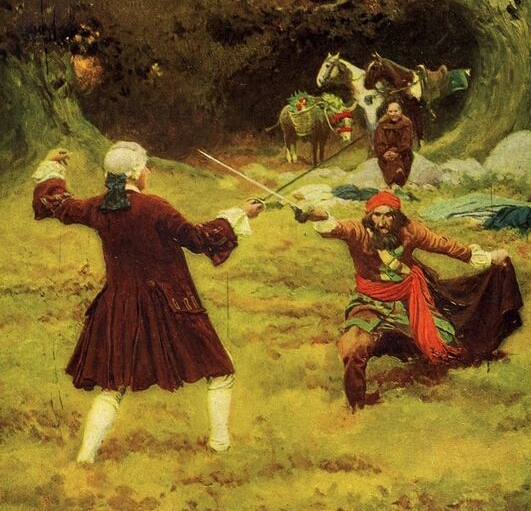 Article picture by the great Howard Pyle, public domain. Excellent idea! I’d buy something like that, especially if it contained scenarios that could be played with different rules. pdf might be the best format, printed copies would become quite expensive, especially considering p&p. In my opinion, good scenarios don’t need very specific force descriptions, but they need a map (or a clear description of the location) and clear objectives. Forces can be generic enough to be used for many systems, but precise enough to make the scenario unique, such as: a unit of militia with low morale, or a handful of undisciplined pirates etc. Making them playable as RPG scenarios is a good idea! Do it – I’d get it because it’s you, but mostly you should do it because it would be fun! Agreed! That’s how I see it as well, regarding commercialization. If someone else wants it, it’s an added bonus! That sounds great mate! I’d buy it because it’s COOL!! I’d be mostly interested in the fluff/back story on notable characters who reside in George. Can’t wait. Why only 30 pages? Make it epic man. Thanks ork! I figured I’d set a reasonable goal first, to keep up motivation. It’s easy to take a too big bite first and then choke on it, so I set the bar fairly low with the possibility of extending it if the process takes off. Hmm, maybe I should take a leaf out of your book haha. It has its benefits 😀 although you tend to miss out on insanely grand things.